Nonetheless, the years 1987 to 1989 were still pretty much business as usual in the USSR. People went to work, received their salaries, and enjoyed an acceptable standard of living. Economics professor David Kotz notes that “the increasingly radical economic reforms of the late 1980s were disruptive, but economic growth continued at 2.2% per year from 1985-89. The Soviet economy did not have a single year of economic contraction over the whole period from 1950 to 1989”.3 However, from 1989 the winds of change picked up pace and gathered into a hurricane, the destructive power of which caught the masses off-guard and ultimately turned Soviet socialism to rubble. By 1989, Gorbachev and his allies had completed their quiet coup, consolidating their power, removing enemies and rivals from positions of influence, and creating an open road for their ‘restructuring’. In the Congress of People’s Deputies, they now had a legislative body that was more-or-less free from the reins of socialist sanity that might otherwise be applied by ‘conservatives’ and ‘hardliners’. The media had succeeded in creating a political atmosphere in which any criticism of perestroika was simply ‘Stalinism’ – a word whose usage had come to imply acceptance of the most hyperbolic McCarthyite propaganda. At the turn of the decade, the economy was in free-fall. With discontent rising and the CPSU in forced retreat, other political forces started to rise. Nationalist separatists in the non-Russian republics were able to prey on rising popular anxiety over the economy. Russian demagogues started denouncing the unequal relationship within the union whereby a wealthier Russia helped to sustain living conditions in central Asia. ‘Radical reformers’ like Boris Yeltsin, strongly backed by western media and money, stirred up mass discontent. Strikes became a feature of everyday life. The threat of counter-revolution, previously unthinkable, became all too real. In 1989 and 1990, socialist allies in Europe were transformed overnight into pro-western capitalist regimes, leading to further imbalances in the Soviet economy – the USSR had long enjoyed a symbiotic trade relationship with the German Democratic Republic, Poland, Bulgaria, Hungary, Romania and Czechoslovakia – as well as to a growing popular perception that the writing was on the wall for European socialism. Much frustrated by the economic crisis, and falling prey to the cynical demagoguery of Yeltsin and his coterie, who blamed all problems on socialist planning and the ‘privileged bureaucracy’, coal miners carried out strikes on an unprecedented scale. This contributed to a crisis of legitimacy. Gorbachev had little choice but to go running to the western banks, with which the Soviet Union quickly worked up a sizeable debt. As bad as things got, the Soviet working class was still not won over en masse to the putative delights of capitalism. Even with the level of ideological deterioration that had taken place; even with the pernicious influence of a hostile, anti-communist media; Soviet workers remained proud of the world-shaking achievements of their forebears and of the USSR’s record of solidarity with the global anti-colonial and anti-imperialist struggle. These were for the most part educated people whose loyalty could not so easily be bought. Many understood that the luxurious and carefree lifestyle portrayed in Hollywood movies had its counterpart in the suffering and exploitation of the western working classes and the oppressed masses of the developing world. Indeed there were many in the grassroots of the CPSU that were highly critical of the retreat from Marxism-Leninism, but these were precisely the elements that were disenfranchised under Gorbachev’s glasnost. The vote was boycotted by the governing bodies in Lithuania, Latvia, Estonia, Armenia, Moldova and Georgia, but in the rest of the country turnout was 80%, with 147 million total votes cast. The result was an overwhelming majority in favour of maintaining the USSR: 78% voted in favour. Soviet workers wanted to maintain and improve socialism and maintain the union; the USSR’s dissolution at the end of 1991 was in that sense profoundly anti-democratic. However, crisis and confusion were so entrenched that, while people might vote for socialism, most weren’t mobilised to fight for it. In spite of their catchphrases about ‘democratisation’, the anti-communists had absolutely no interest in the will of the Soviet people. Instead, they were intent on pushing through their programme of capitalist restoration by any means necessary. 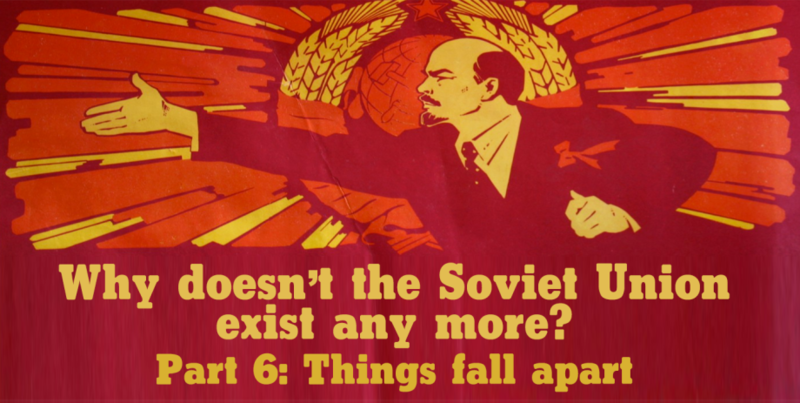 Thanks largely to perestroika and glasnost, they had both the economic incentive and political leverage to dismantle socialism, break up the USSR and send its people hurtling into an economic and social crisis of untold proportions (about which more in the next article in the series). The decree on foreign trade of 1988 opened an important means to get rich. The Soviet Union’s low controlled prices made many Soviet goods, particularly oil and metals, potentially lucrative export items for anyone who could get hold of them. After this decree opened up foreign trade to private firms, import-export companies were formed, in the legal form of cooperatives, which soon began to conduct a partly legal, partly illegal, and very profitable export trade. Over three thousand such firms were formed… By 1990-91 a new group of private capitalists had developed and was getting rich mainly through connections with the outside world… Any turn away from the emerging pro-capitalist direction of change, toward either a return to the building of a reformed socialism, or an effort to bring back the pre-perestroika system, would threaten the basis of their lucrative economic endeavours. Proceeding to capitalism was essential to the survival of their new businesses. This pro-capitalist constituency had money. And money, for the first time, had become a significant factor in the Soviet political scene. ‘Free elections’ turned out not to be so free in the case of the Congress of People’s Deputies, where money bought high-profile campaigns and extensive media coverage. This was an unfamiliar environment for the silent majority in the Communist Party that had been brought up to believe that political leadership was a responsibility and honour earned through service to the people, not paid for with ill-gotten gains. This change, together with Gorbachev’s insistence on dropping quotas for working class representation, meant that “a striking change occurred in the percentage of deputies who were workers, collective farmers and office employees: this dropped from 45.9% of the 1984 Supreme Soviet to only 23.1% in 1989”.11 The counterpart to this was the monumental increase in the representation of management and intelligentsia. With the formation of the overtly anti-communist ‘Democratic Russia’ movement in January 1990, the pro-capitalist elements joined forces and consolidated around a political vehicle that seemed to offer the quickest possible route to their chosen destination. Democratic Russia candidates managed to win a plurality of seats in the Russian parliamentary elections of March 1990, including several key Soviets (Moscow and Leningrad among them). Democratic Russia also played the major role in electing Boris Yeltsin as Chair of the Russian Parliament in May 1990. By this time, Yeltsin had become recognised as the undisputed leader of the anti-communist opposition. He resigned from the Communist Party in June 1990, realising that his differences with Gorbachev were insurmountable: Gorbachev, for all his ineptitude and liberalism, still hoped to keep the USSR together and maintain some elements of socialism – for example the welfare state. Yeltsin and his cohort wanted to press ahead with ‘shock therapy’ neoliberalism and had lost patience with Gorbachev. Yeltsin’s bold statements against the communist ‘conservatives’, his nationalist demagoguery, and his carefully nurtured (and entirely inaccurate) image of incorruptibility won him phenomenally high approval ratings from 1989 onwards. The reactionaries placed their hopes in his shaking hands. The imperialist countries made it perfectly clear which side they were on, openly stating that any support for the Russian economy via the international banks would be predicated on an economic programme of large-scale privatisation and deregulation. Within this framework, “saving Russia” meant embracing the most brutal neoliberalism. In August 1989, following extended negotiations between the Polish government and the ‘Solidarity’ union movement (a grateful recipient of bountiful CIA funds and papal support), leading anticommunist Tadeusz Mazowiecki became prime minister and Poland became the first of the European socialist states to fall. Perhaps the most dramatic and symbolic events in Europe were in the German Democratic Republic, where large demonstrations were held, initially calling for greater democracy and bemoaning a stagnant economy. Anti-communist elements saw their opportunity and started steering the demonstrations towards a demand for German reunification – thereby implying that the GDR authorities were responsible for the ongoing division of the country. The counter-revolution in the GDR picked up pace rapidly after the Hungarian state – by now well advanced along the road of its own version of perestroika – tore down its border with Austria. Much encouraged by the western authorities, several hundred East Germans took the opportunity to cross the Austria-Hungary border and make their way to the FRG. This created a panic situation in East Berlin. In November 1989, crowds of Germans on both sides started dismantling the wall. Given the ‘facts on the ground’ created by the Hungarian border opening and the Soviet refusal to intervene, the authorities in the GDR – by now vulnerable and indecisive, with the Erich Honecker leadership sidelined – chose not to prevent the fall of the wall. Within a year, the GDR ceased to exist. By 1990, communist parties had been removed from power in Poland, Germany, Hungary, Czechoslovakia, Bulgaria and Romania. Albania would soon follow suit, and Yugoslavia was descending into a series of nationalist secessions and terrible wars. The Warsaw Treaty of collective security was disbanded in February 1991. A few months later the Council for Mutual Economic Assistance (popularly known as Comecon) was dissolved. The collapse of the socialist states in Central and Eastern Europe served to significantly increase the pressure on Soviet socialism. At the most practical level, there had been a tight economic integration between the CMEA countries: a similar economic model meant that economic planning could be internationalised. The sudden disappearance of the USSR’s key trading partners meant a vertiginous decline in imports and exports, leading to sudden shortages of various essential goods. The sorry state of affairs in the Soviet economy gave a further stimulus to nationalist separatist movements, particularly in the western republics. Between March and May 1990, national separatists dominated the elections to the Supreme Soviet in Lithuania, Estonia and Latvia; all three republics promptly declared independence. Although Gorbachev opposed the independence of the Baltic states, he ultimately chose to accept it rather than enforce the union and thereby invoke the ire of his new-found friends on the international scene: US president George HW Bush and German chancellor Helmut Kohl. By mid-1991, the confidence of the anti-socialist opposition was growing by the day. On 20 July, Yeltsin issued a decree banning the Russian branch of the communist party from operating in government offices and workplaces within the Russian Republic.19 It was perfectly obvious to all concerned that this was a power grab aimed at finishing off the CPSU and establishing Russia as an independent (capitalist) country. Seeing their country hurtling towards oblivion – and recognising that Gorbachev lacked either the will or the ability to save it – a group of high-level Soviet officials organised themselves to take control of the country and establish a state of emergency, with a view to pausing the reforms and pursuing all measures to prevent the dissolution of the USSR. These officials organised themselves under the name State Committee on the State of Emergency (SCSE). Among them were some of the government’s top leaders, including Gennady Yanayev (Vice President), Valentin Pavlov (Premier), Boris Pugo (Interior Minister) and Dmitry Yazov (Defence Minister). They were joined by army commander-in-chief Valentin Varennikov and KGB head Vladimir Kryuchkov. On 18 August, with Gorbachev on holiday in the Crimea, tanks moved into Moscow and a state of emergency was declared. The SCSE issued its Appeal to the Soviet People on 19 August, noting that “there have emerged extremist forces which have adopted a course toward liquidation of the Soviet Union, the collapse of the state and the seizure of power at any price” and denouncing the economic reforms which had caused “a sharp drop in the living standards of the overwhelming majority of the population and the flowering of speculation and the shadow economy”.20 The statement promised to clamp down on the emerging capitalist class and to initiate a country-wide discussion on the future of the federation. With the SCSE defeated and imprisoned, events moved at lightning pace. On 23 August, Yeltsin pushed through the suspension of the Russian branch of the Communist Party. On August 24, Gorbachev dissolved the CPSU Central Committee and resigned from his role as General Secretary (maintaining his position as President of the country). A day later, Yeltsin ordered the transfer of the Russian Communist Party’s property to the Russian Parliament. The Soviet flag outside the Kremlin was replaced with the Russian flag. Nothing meaningful remained of the Soviet state. In early November, Yeltsin issued decree number 169, banning the CPSU altogether. He sought to justify this move on the basis that “it has become evident that as long as the CPSU structures exist, there can be no guarantee against one more putsch or a coup”.27 This was thoroughly disingenuous, given that his executive order restricting the party’s activities in Russia was one of the key factors precipitating the SCSE’s attempt to restore socialist governance. However, there was by now nobody left in the leadership with the courage or strength to sabotage Yeltsin’s bourgeois bulldozer. As discussed above, there was little support for Soviet dissolution in the Central Asian and Caucasian republics, but it wasn’t conceivable to carry the Soviet Union on without its most populous and prominent component. The Belavezha Accords were ratified a week later by the leaders of the remaining republics. Gorbachev’s resignation finally came on 25 December 1991. With no legal precedent or constitutional framework, Yeltsin simply transferred the Soviet state bodies and property to Russia, and on 31 December, the Soviet Union formally ceased to exist. This was the real coup d’etat. A great country was removed from the map, against the wishes of the majority of its people, by opportunist and conniving leaders. It was nothing short of a tragedy. The next article will discuss the effects of the Soviet collapse, both within the territory of the former USSR and in the wider world.